The Place Well, it’s a fast food. So we are not expecting any fanciful surprises. Still, it’s tRP first time trying out Texas Chicken – truth is, there are many other fast food options in Singapore and we do usually stick to the usual suspects when it’s time to sin! What surprises us for Texas Chicken is the number of branches it already have in Singapore – from the North (Causeway Point) to the South (Gardens by the Bay, Vivo City, Great World City) and from the West (WestGate, Star Vista) to the East (Expo, Changi Airport, Changi City Point) and even in central Singapore (Nex, Seletar Mall)! The Food Now, you must be wondering what we had at Texas Chicken. tRP was there for a taste test for their new Jalapeño TXtreme Chicken! Coming in a set of 2 pieces of the Jalapeno TXtreme Chicken, a handmade sweet and savoury Honey Butter Biscuits and a side of either the crispy French Fries, Mashed Potatoes, Coleslaw or Onion Rings at a affordable price of S$8.20! First on the Chicken, I must admit that despite my initial scepticism, it tasted as well as its other competitors! Let’s face it, fried chickens are sinful – and if you are craving for one, let’s make sure we make our calories count! The Jalapeno-styled chicken is a tribute to the origins of Texas Chicken, where it was founded in San Antonia, Texas, USA back in 1952. Marinated with jalapeno peppers and other spices to give it a unique ad intense spicy flavour. 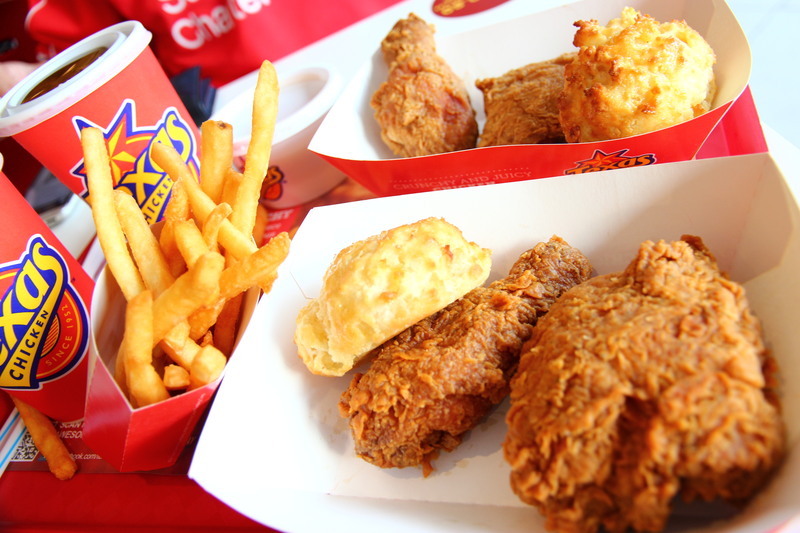 This is on top of the Original and Spicy variation Texas Chicken currently offers and Singapore is the first of its 25 international branches to get a taste of it! Frankly, what caught our attention was actually the Honey Butter Biscuits, which came with the meal. While tRP had expected it to taste like a normal dry and bland scone-lookalike biscuit, the Biscuits at Texas Chicken surprised us! It was honey-coated, with a warm-buttered inside, nice enough to crown this the best Biscuit I had since – I ain’t joking! Just make very sure you are served a warm biscuit, that’s what made the difference! Rants Well, it’s not gourmet food we are talking about here. So expect fast food as, well fast food. Be prepared to sin, but life’s too short to count the calories everyday – just do it in moderation! Will I return again? Yes, for the Biscuits for sure! As for the mains, will definitely keep Texas Chicken in mind now – this will not be my first and last. Special thanks to Texas Chicken and Ninemer for the kind invitation. Nice review again, but Texas Chicken is not my cup of tea. Nor KFC. I prefer the local Asian fare, especially Korean like NeNe and BonChon, as well as the Indo stuff like Malioboro and Ayam Penyet Ria. Texas Chicken just seems too boring for me. Texas Chicken fried style is quite similar to KFC! It’s really sinful but once in a while indulge is harmless! Oh yes, we love Ayam Penyat as well!